L-R: Mags Campbell from St Mary Star of the Sea, Alex Wilson from Rye Community Primary, Natasha Nijhuis from Baird Primary, and Hannah Foster from Rye Community Primary. Copyright Simon Dolby, Inspire Schools, sdolby@inspireschools.org.uk 0844 264 0292. Teachers have kick-started this year’s Buster’s Book Club with a bang – and there is still time for more schools to join the reading reward scheme. Literacy leaders from Hastings and Rye attended a training session to find out how to best use the scheme to turn pupils into reading champions. The event was organised by educational charity Inspire Schools and hosted by Baird Primary Academy in Hastings. In attendance were representatives from Rye Community Primary and St Mary Star of the Sea School in St Leonards. Delegates were given vouchers for attractions including Drusillas Park to use as competition prizes for their best reading classes. 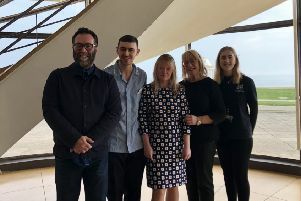 They also received information on the Sussex Teacher of the Year Awards – currently open to nominations – and the Literacy Stars scheme, which rewards pupils who have made efforts to promote literacy in their schools. Buster’s Book Club officially starts in January but schools can sign up at any point during the year. Each child is given a home reading target by age group and classes compete both within school and against other schools to see who can read the most. Prizes include trophies, books, and storyteller visits. If all participating schools collectively achieve a million minutes of reading, pupils are given the honorary title of reading millionaires. To nominate someone for the Sussex Teacher of the Year Awards before the March 1 deadline, visit www.SussexTeacherOfTheYear.co.uk.